Cloud-connected systems are becoming increasingly important across a wide range of industries. From agriculture to smart cities and consumer to industrial, real-time accessibility to systems and data is a game-changing element for these industries, accelerating both the pace and efficiency of business. To enable the creation of these smart designs, Microchip Technology Inc. has expanded its collaboration with Amazon Web Services (AWS) to support cloud-connected embedded systems from the node to the cloud. Supporting Amazon Greengrass, Amazon FreeRTOS and AWS Internet of Things (IoT), Microchip provides all the components, tools, software and support needed to rapidly develop secure cloud-connected systems. Microchip’s Amazon FreeRTOS Curiosity PIC32MZEF Bundle can be used to develop Amazon FreeRTOS-based applications. The bundle includes Curiosity PIC32MZEF Development Board, Wi-Fi 7 click board, LAN8720A PHY Daughter Board and USB UART click board. 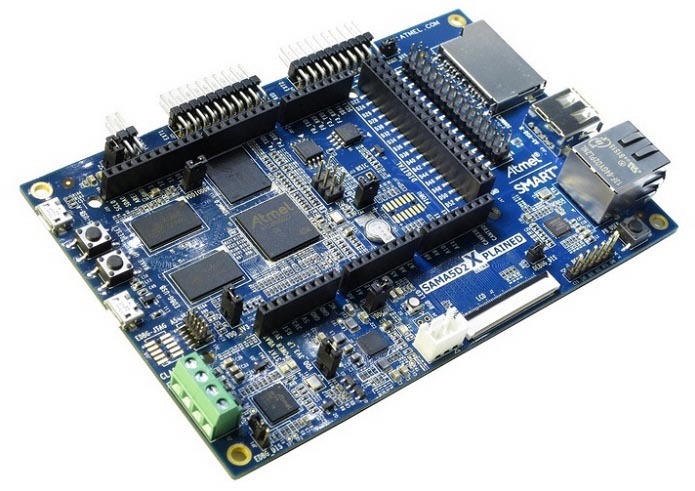 The Curiosity board is a fully integrated 32-bit development platform which also includes two mikroBUS expansion sockets, enabling designers to easily add additional capabilities (Figure 1). for develop cloud-connected embedded systems. mikroBUS expansion sockets Click boards including the WiFi 7 Click based on WINC1500 and USB UART Click can be used to develop an AWS cloud-connected application in Amazon FreeRTOS. To create an Ethernet-connected demo you may also use LAN8720A PHY Daughter Board. For systems requiring data collection and analysis at a local level, developers can use Microchip’s SAMA5D2 series of microprocessors (MPUs) with integrated AWS Greengrass software (Figure 2). This will enable systems to run local compute, messaging, data caching and sync capabilities for connected devices in a secure way. This type of execution provides improved event response, conserves bandwidth and enables more cost-effective cloud computing. Figure 2. Microchip SAMA5D2 series of MPU Block Diagram. The SAMA5D2 devices, also available in System-in-Package (SiP) variants, offer full Amazon Greengrass compatibility in a low-power, small form factor MPU targeted at industrial and long-life gateway and concentrator applications. Additionally, the integrated security features and extended temperature range allows these MPUs to be deployed in physically insecure and harsh environments. The ATSAMA5D27C-D1G SiP contains the SAMA5D27 processor and 1 Gb DRAM, providing the recommended amount of memory required to run Greengrass in the same package as the processor. This SiP simplifies the PCB design, lowers the PCB layer count and solves the problem of long term DRAM availability. AWS Greengrass is software that lets you run local compute, messaging, data caching and sync capabilities for connected devices in a secure way. With AWS Greengrass, connected devices can run AWS Lambda functions, keep device data in sync and communicate with other devices securely – even when not connected to the Internet. AWS Greengrass seamlessly extends AWS to devices so they can act locally on the data they generate, while still using the cloud for management, analytics and durable storage. AWS Greengrass authenticates and encrypts device data at all points of connection using AWS IoT’s security and access management capabilities. This way data is never exchanged between devices when they communicate with each other and the cloud without proven identity. The SAMA5D2 Xplained Ultra board, which can be used for AWS Greengrass designs, is a fast prototyping and evaluation platform for the SAMA5D2 series of MPUs (Figure 3). In IoT security, trust in the end node is critical. To solve the challenge, Microchip offers customers a tailored hardware-based authentication architecture to create a unique, trusted and protected device identity. Secure elements such as the ATECC508A and the newer generation with the ATECC608A illustrate how a full certificate-based chain of trust is built using Just In Time Registration (JITR) and the Use Your Own Certificate (UYOC) functions from AWS IoT. 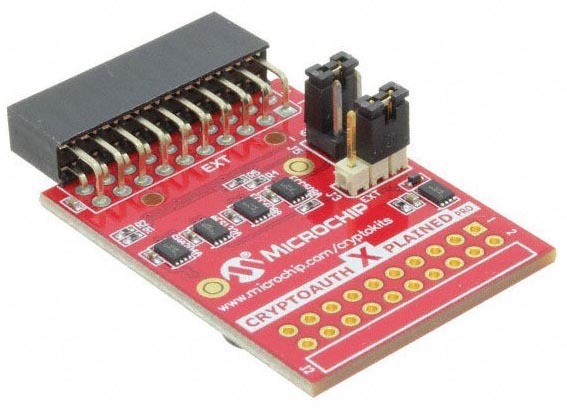 Additionally, the CryptoAuth Xplained Pro evaluation and development kit (ATCryptoAuth-XPRO-B) is an add-on board for rapid prototyping of secure solutions on the AWS IoT platform and is compatible with any Microchip Xplained or XplainedPro evaluation boards (Fugure 4). The AT88CKECC-AWS-XSTK-B kit offers an all-in-one development solutions with re-architected firmware running FreeRTOS on a Cortex-M4 MCU (ATSAMG55), a Wi-Fi module (ATWINC1500) and the ATECC508A, an upgrade with the ATECC608A is also available.